Tomahawk fills a void. As its members were at the start of the band essentially free agents exiting their respective roles as figures in the Alternative boom of the early to mid 90s, the likes of Duane Denison (The Jesus Lizard), Mike Patton (Mr. Bungle, Faith No More), John Stanier (Helmet) and Kevin Rutmanis (Melvins — the only one with an active gig), Tomahawk provided a means to keep them all participants in the industry, making good music that continued in the direction of evolving what had been up to that point the primary music of the decade prior. Patton’s Ipecac Recordings allowed the band to operate without relying on the mainstream labels that had begun turning their collective, monetarily diverted gaze to teen pop, garage rock and Eminem. Twenty plus years after Angel Dust, Liar and Meantime, Oddfellows, Tomahawk’s fourth album, and first with bassist Trevor Dunn (Mr. Bungle, Fantômas, Melvins Lite), continues to generate solid Alt-laced rock music, cultivating through no shred of comprise an accessible variance of sound with a base rooted in the 90s. In no way revisiting the thematic shift of 2007s Anonymous (whose focus was solely devoted to the music of Native American ritual), Oddfellows recalls much of what Tomahawk had worked to musically refine with 2003’s sophomore release, Mit Gas, a progression from the scraping guitar tones and unpolished drum sounds of their self-titled debut. Stanier’s twenty-ton kick drum drops and vintage Jesus Lizard riffs more or less ooze from Denison’s guitar within seconds of the title track. Patton’s croon echoes like it’s sung from the mouths of some maniacal chorus. It’s all very familiar and welcome. As unfair, and potentially stifling from a creative standpoint, as it would be to call Tomahawk a surrogate band of sorts, there is a sound quota or style that they fulfill that might be considered antiquated or era-specific. While the point is understandable, theirs is a sound that had helped define the oft rugged and alienating disposition of a counterculture. Bands perpetuating noise-similar rock music all seem relegated to the land of throwback, although metal and its various offshoots continues to enjoy its place as mostly unaccepted and difficult to grasp. While Tomahawk attempts to keep its music on the louder side of things, a song like Stone Letter wouldn’t need to undergo too many production decisions to be turned into an FM ready pop track, harkening back to a time when a song like Midlife Crisis would be heard on a car radio, (or at the very least seen on video television). Industry dollars made Alternative music feasible and generations have grown accustomed to hearing Faith No More, singing “WHAT! IS! IT!” without comprehending exactly how unusual this music once was. With that in mind, Oddfellows, though Patton, Denison and Stanier have all outgrown their pasts creatively speaking, is in some ways a gateway to reminiscence. This isn’t to say that Tomahawk is about looking back. On the contrary, they’re a forward-thinking band that’s interested in what each member brings to the conversation. They expand on what they know; implementing whatever’s acceptably current in order to evolve. While the title track will evoke the splintery and atonal nature of The Jesus Lizard and the be-bop’d bass rhythm of Rise Up Dirty Waters may recall California era Mr. Bungle, (quite probably thanks in part to Dunn’s involvement), Tomahawk has since its debut defined itself and Patton provides enough of an anchor to carry the band through lamentation (I.O.U.) and noir-ish narrative (A Thousand Eyes) in addition to its heavier output, which make up the album’s best moments. White Hats/Black Hats, handclaps on the hook and heavy bass throb at its core, is heavily harmonized and multi-tracked, as vocal as it is instrumental. The whale song of Denison’s guitar that accents The Quiet Few arcs perfectly over the urgency of Patton’s delivery and Dunn’s low end, no discernable verse-chorus-verse structure utilized as a midsection of rhythmic shifts winds up bookended by two iterations of the song’s initial attack. With South Paw, Stanier remains attentive to the snare drum, only softening and hardening his beats as the music fluctuates. There’s an earth-encrusted feel to I Can Almost See Them and a drunken lounge act stride to Choke Neck that don’t deviate too heavily from the album’s overall aggression, varying its intensity through personality as opposed to volume. Waratorium could very well have provided Oddfellows its closing track, the dull and unresolved Baby Let’s Play ____ and paint-by-numbers punk-based Typhoon sounding tacked on next to the album’s other better realized cuts. Otherwise, Oddfellows really doesn’t disappoint and there’s no reason to expect that it would. 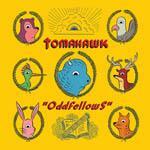 A supergroup built from a legacy of prolificacy, passion and a need to continue, Tomahawk continues to fill the void. And, they sound great doing it.